This is the living place of Python for Astronomers: An Introduction to Scientific Computing (not to by confused with python4astronomers, which is another good python resource compiled by Tom Aldcroft and several others at the CfA). Coauthored by Imad Pasha and Chris Agostino, this textbook serves as the course text for Astronomy 98/198 at UC Berkeley, and is geared toward introducing basic Python at the beginner level with an emphasis toward astronomical applications. Basic UNIX and terminal commands, including remote server access. An introduction to basic python and syntax. Reading in and manipulating data files. To access the textbook, you can click the image above, click the quick-link on the side, or click the "Textbook" tab at the top of the page. You can also access various tutorials, both interactive and purely instructive, by clicking on the "Tutorials" tab at the top of the page. We also provide resources like guides to UNIX, Vim, SSHing, etc., which are available under the "Resources" page. Imad Pasha is a graduate student at Yale with BA degrees in physics and astrophysics from UC Berkeley. His research focuses on galaxy evolution and AGN at high redshift. Questions? Comments? Suggestions? Feel free to get in touch with me at ipasha[at]berkeley.edu or imad.pasha[at]yale.edu! 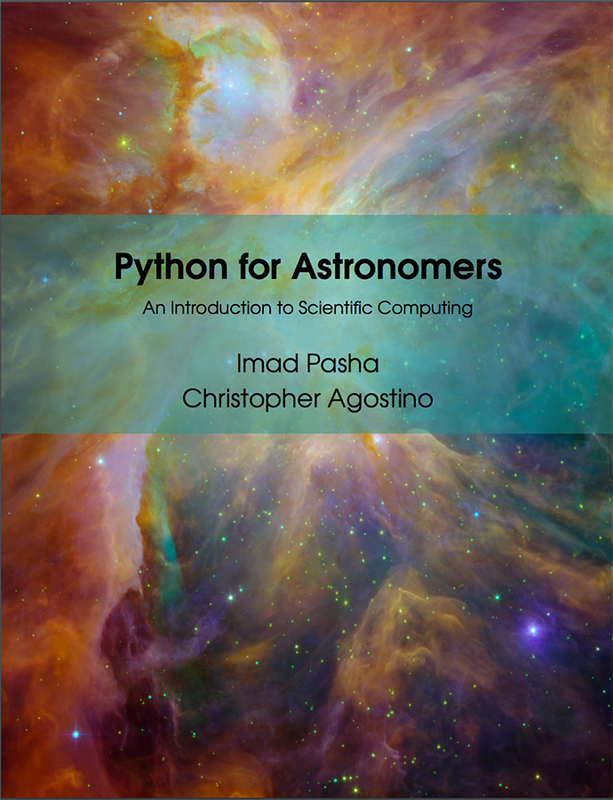 Python for Astronomers: An Introduction to Scientific Computing by Imad Pasha & Christopher Agostino is licensed under a Creative Commons Attribution-NonCommercial-ShareAlike 4.0 International License.